What happens when Critical Minds meet compassionate hearts? The University of Dayton is located two miles southeast of downtown Dayton, Ohio, a vibrant community offering the amenities of larger urban areas while retaining its Midwestern warmth. The city is very accessible, and the Dayton International Airport is only 15 minutes from the University. Type of SCHOOL: The University of Dayton is a private, coeducational, residential research university. Size of Campus: The University’s 398-acre campus blends historic brick buildings with modern architecture and state-of-the-art facilities. 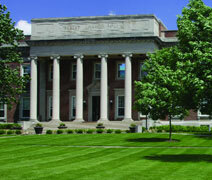 Number of Students: The University is home to more than 8,200 undergraduates and 2,300 graduate and Law students. Number of Faculty: There are 1,000 full- and part-time faculty members. 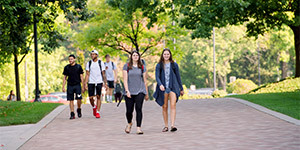 Colleges, Programs, and Degrees: The University offers more than 80 undergraduate and 50 graduate programs in the Arts and Sciences, Business Administration, Teacher Education, Health Sciences, Engineering, and Law (see listing to the left). Geographic Diversity: With students hailing from everywhere from China and India to Great Britain and Kuwait, there is a wonderful international presence to be found on our campus. Our undergraduate and graduate students represent more than 70 countries. International Student Services: Located in the Center for International Programs, International Student and Scholar Services assists international students with immigration issues, counseling, personal advising, social and extracurricular activities, and emergencies. Our Intensive English Program (IEP) provides instruction in English-language skills. Financial Aid: We offer merit scholarships to select first-year and transfer international undergraduate applicants. School-year employment and payment plans are also available. Test Score Requirements: Undergraduate: TOEFL minimum score of 70 (internet based) or 523 (paper based); the University of Dayton also accepts scores from ELPT(minimum 956), APIEL (minimum 3), and IELTS (minimum 6.0). 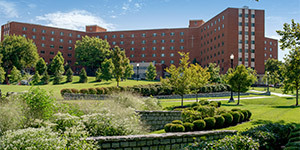 Located in Dayton, Ohio—a Certified Welcoming city—the University of Dayton is a Marianist Catholic institution committed to educating the whole person, creating a unique community of curious minds andcompassionate hearts. We constantly use what we learn and apply it in our own backyard and around the world to make a difference in the lives of others. As a Princeton Review top 20 schoolfor internships, we find ways to helpyou discover who you’re called tobe so you can lead a life of purpose and fulfillment. At the University ofDayton, we know you’ll become a key member of a community united by shared beliefs, inspired ideas, and diverse perspectives—and you’ll make the world a better place while you learn. At the University of Dayton, weknow we live in a world of endless possibility. So go ahead, ask the big questions. Let’s work toward the common good together. All are welcome here. Our Marianist Catholic tradition embraces community, and approximately 85% of students live on campus. It’s one of the reasons our students are among the happiest in the nation. We offer more than 270 student organizations, with 45 dedicated to service and social action, so we can make a difference together. With more than 8,000 full-time undergraduates, a 15:1 student-faculty ratio, and an average class size of 26,we are constantly interacting with and inspired by one another. Looking to develop your faith? We offer countless retreats, prayer communities, and discussion groups that provide opportunities for community building, prayer, and self-reflection.